A still from Shraddha Kapoor and Prabhas starrer Saaho was leaked online. The wait for Prabhas’ Saaho got difficult for fans as a still from the upcoming action-thriller went viral on social media. Featuring Shraddha Kapoor and Prabhas in a romantic pose, the picture caught the attention of many. However, neither the production house nor the actors shared the still on their official social media handles. In the viral photo, Prabhas can be seen gazing into the eyes of his leading lady Shraddha. The actor, who is making her Telugu debut with the movie, looks enchanted by the charm of her co-actor. Presumably, the still is from a song sequence in the film. Excited to work with Prabhas, Shraddha Kapoor had said, “I am definitely excited to be able to work with Prabhas. This is a great opportunity for me.” During the shoot of the film in Hyderabad, the two actors had a great time together and Prabhas even treated Shraddha with Hyderabadi delicacies. Earlier, through the two teasers of Saaho, we have got a glimpse of the grandeur of the actioner. The gunfight scenes gave a hint of the visual effects, equipment, stuntwork and props that have been employed in the Sujeeth directorial. The new-age action entertainer is said to have been made on a whopping budget of Rs 300 crore, which is higher than the budget of Prabhas’ global hit Baahubali 2. Shot simultaneously in Hindi, Telugu and Tamil, the film is currently in its post-production stage and is scheduled to release on Independence Day. 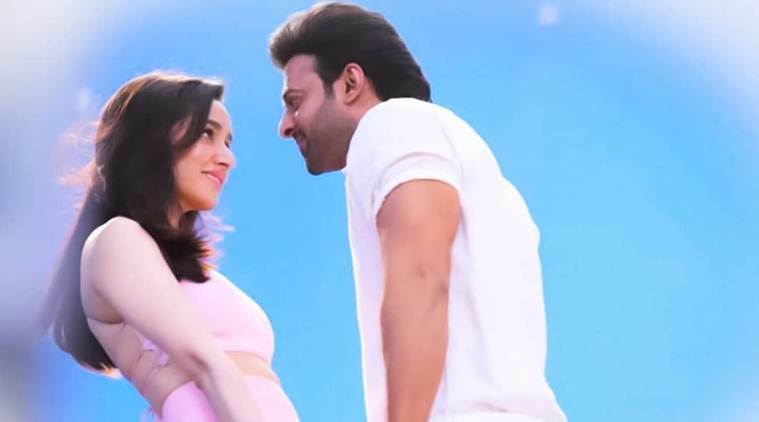 Apart from Prabhas and Shraddha Kapoor, the film boasts of an ensemble cast including actors like Neil Nitin Mukesh, Arun Vijay, Jackie Shroff, Mahesh Manjrekar and Evelyn Sharma.